Learn how to connect myphoner with other tools to sync your data or automate your workflow. Would you like to use myphoner to regularly follow up on customers and contacts that are managed by your CRM system or contact manager? How do you generate leads? Do you buy them from a marketing database, or collect them from a web form? Do you browse the Internet and write them down manually? Would you like those leads to appear in myphoner automatically? What happens when you've got a winner? Do you send them a welcome email, trigger an onboarding process, send them to shipping or invoicing, or something else? Would you benefit from automating these workflows? If you answered yes to any of these questions, this guide is for you. Believe it or not, setting up the integration is easy. All you need to know is what the lifecycle of your data is like and what events in your process should trigger a data exchange. If you already know you just need the same data in myphoner as you have in your CRM, then go ahead and synchronise with PieSync now. On the other hand, if you first need to know about automating workflows to get leads in and out of myphoner as certain events happen, read on. let the product delivery team know. When I get a new Twitter follower I want to create a lead in myphoner. When I have a new winner in myphoner I want to create an event in my Google calendar. Good job! When you've done this, move on to the Zapier guide. Still not sure: PieSync or Zapier? Check out this comparison or talk to us and tell us what you want to do. We will help you decide. 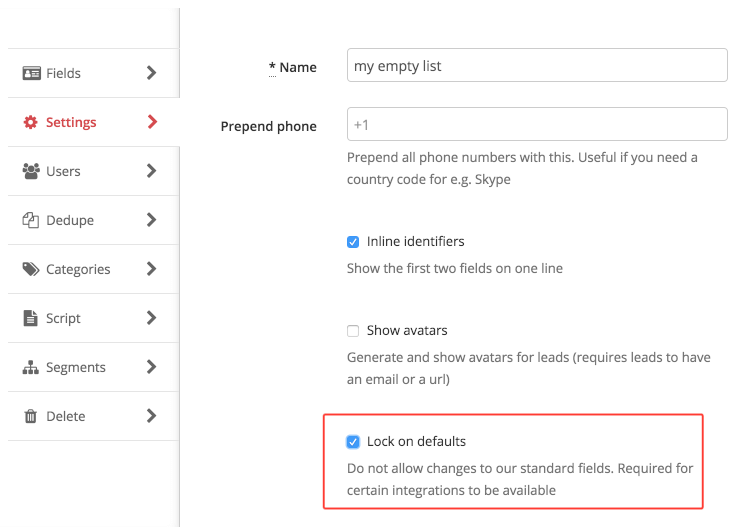 Before you start syncing you need a list in myphoner that holds our predefined default fields and has been 'locked to defaults' to prevent the sync from breaking if you change a field name. Just choose 'Use default settings' when creating a list or 'Default template' when importing a file and your list will have the default fields you need. Default fields - required to start a sync connection with PieSync. 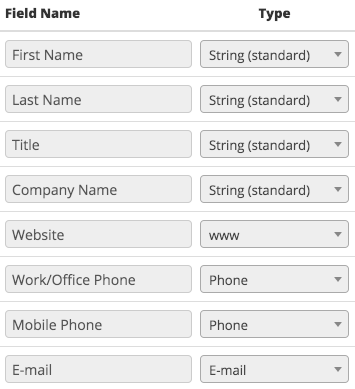 You can add more fields if you like, but these default ones have to remain for the sync to work. Once the fields are in place go to 'Settings' on your list configuration screen, click on 'Lock on defaults' then 'Save'. You're all set to sign up with PieSync and start importing your leads. For more details, read the PieSync helpdesk article on connecting myphoner. View this screencast to get a quick introduction to setup your first automation of a workflow. Screencast that explains how to get started with integrations using Zapier. First, sign up on zapier.com. They have a limited free plan as well. When asked to connect to myphoner, you should consider what purpose the Zap is for. You can connect with your personal API key that is found under My profile -> Credentials, or you can connect with the account API key, which is found under Manage -> Configure -> Integrations. The difference is, that your personal API key will give zapier the same access as you have when using myphoner through your browser, whereas the account API key will give zapier unlimited access to your myphoner account. Use the account API key when you are setting up Zaps for all of your users, for example adding a new record in your CRM when there's a new winner in myphoner. Use you personal API key when making a Zap that should only work for you, for example setting a todo in your personal todo system or adding a calendar entry in your own calendar. Now go ahead and create your first Zap. Use one of the guided zaps below, browse the zapbook or simply create a new zap from your dashboard in Zapier and follow the on-screen instructions. View our screencast above for an example of setting up a zap from scratch. 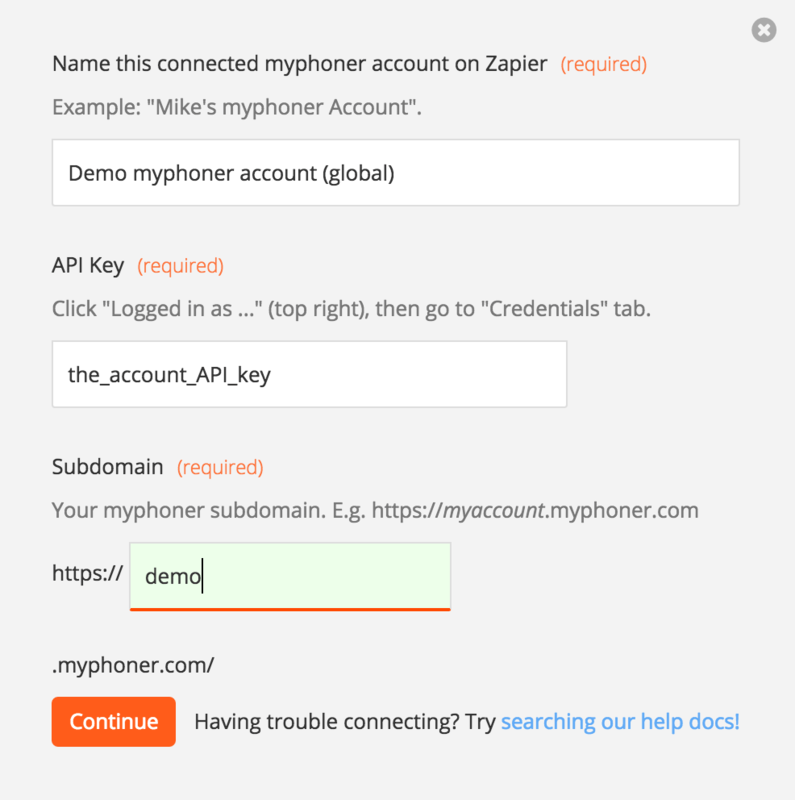 Connecting to your myphoner account in Zapier. Check out the myphoner integrations page on Zapier for example zaps (guided zaps) and more help.